Texan Girl Talks: Week 15: Might just be the week from hell. Yes, you read that right. I've been so sick this week. Not just the oh i'm nauseous. Literally the worst sinus infection ever. I haven't had sinus issue since high school. Kids, don't ever get a cold/sinus infection while pregnant, it's not pretty. So with that being said, this week's post might seem a little blah/random/unorthodox/hormonal. Sleep: I have been sleeping a lot. Probably more in the past week than I have in the past 28 years. I'm actually making up for all the lost sleep that happened in nursing school. I basically didn't sleep for 2 years. To all the Preggos: i've laughed at in the past about sleeping and basically becoming an appendage to your bed, I'm sorry. Gestating is hard. Thinking about becoming preggo? Get an amazing pillow(s). CRAVINGS: Anything citrus. Literally, I could have eaten a bag of oranges this week. As long as it tastes like orange or lime this week, i've eaten it. Potatoes, hash browns, anything potatoes this week. I think my body is telling me it needs lots of vitamin C to get rid of this junk in the body. * Nursing fact: Did you know potatoes are very high in Vit. C?, Eat potatoes if you're feeling a cold coming on! * Orange sherbet! Aversions: Eggs. I don't like eggs right now. Like eating scrambled eggs. I think it's just the texture. Cabbage. UGH. I don't even eat that much cabbage as it is, but a lot of but there's a lot of places in LA that add cabbage to dishes. Tomatoes. Emotions: I've actually been less sensitive this week. Not emotionally constipated, but you know a little less weepy. I don't want to say i've been rage-y, but people have pissed me off a little more this week. For example: not having patience for slow people or gifts that you've bought weeks ago on Amazon, that have just now let you know they are out of stock, 7 days before Christmas. I didn't get find out the gender this week at my baby appointment. I was sad. I really just want to know, Countdown to January 14! I'm really waiting for this nesting thing to kick in so I will feel like cleaning my house... until then we will live in cat hair. My road rage is at an all time high. Here's to praying that we can get through LAX Christmas crowds without unleashing a hormonal rage. My face might stick like this. 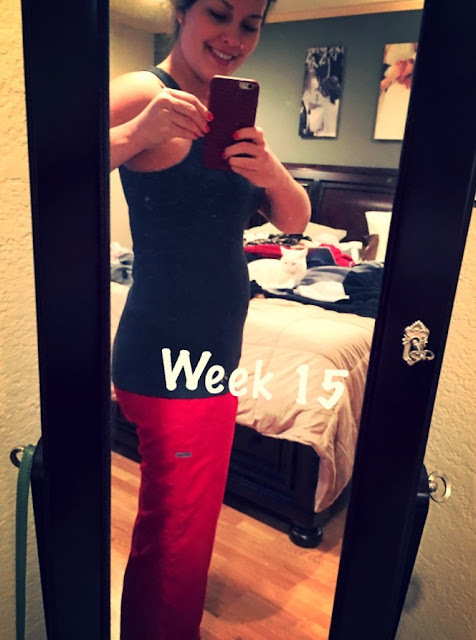 Obligatory Week 15 Bump pic! I'm so excited it looks more and more like a bump every week. Dear Peapod: I can't wait for you to get bigger and I can't wait to feel you move. I thank God everyday that you grow!